Looks like I've got a state theme going. These guys include apricots and almonds, which are native to California...hence the name. There are also some white chocolate chips...just because. When I was home over the weekend, I caught a show on the Food Network about a shake shop in California that used local nuts and dried fruits in its shakes. The apricot and almond combo got me thinking, and that's how this cookie was born. 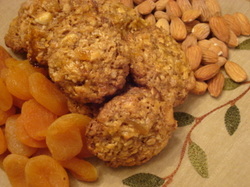 I have a few secrets to infusing these cookies with flavor: apricot preserves, which I use as a dough flavoring and a glaze; toasted almonds and almond extract; and a loads of roughly chopped apricots, which are bright and yummy like little balls of sunshine. Makes about 4 dozen cookies. In a small bowl, combine the wet ingredients and whisk together until smooth. Add the combined wet ingredients to the creamables. Mix together until well incorporated. In a large mixing bowl, add the dry ingredients. Using a spatula, fold together until evenly distributed. Slowly add the dry ingredients to the combined creamables and wet ingredients. Mix until evenly combined. Shape dough into balls--about 2 tablespoons each. Place dough balls about 2 inches apart on Silpat- or parchment paper-lined cookie sheets. Put 1/2 cup of apricot preserves in a small microwave-safe bowl and microwave on high for about 30 seconds or until slightly liquefied. Using a brush, baste each dough ball with the melted apricot preserves.